Sunday, Oct 21st, 3pm – 5pm Two Bostons, 34 Danada Square W, Wheaton. 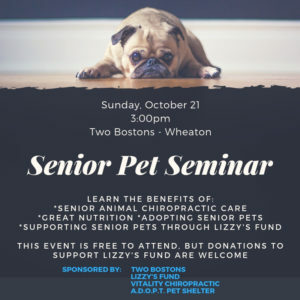 Supporting senior pets through Lizzy’s Fund. The event is free to attend and donations are appreciated to support Lizzy’s Fund.